This thread is reserved for the celebration of HM King Bhumibol Adulyadej of Thailand's 60th anniversary of his accession to the throne on June 9, 2006. There will be a lot of celebrations during the month that mark the anniversary. The great formal celebration will take place on June 12-13. The monarchs of 28 countries have been invited to Bangkok for the occasion. for previous information & articles, please go to Royal Family of Thailand thread. Does anyone know to what address one can send a message of congratulations to His Majesty on the occasion of his Diamond Jubilee. HM The King, Royal Palace, Bangkok, Thailand. Otherwise write to your nearest Thai Embassy and ask them for the correct address. They might even send you some info on the King and the Celebrations. 1. Royal biography are attached herewith. Those events will be spearheaded by the Royal Barge Procession on June 12, and a gala dinner for royal guests and ambassadors the following day. According to Thailand’s Royal Household, there are 29 countries with reigning monarchs. As of last month, it said royals from 22 countries had accepted invitation to join the royal celebrations, including the Emperor and Empress of Japan, the King and Queen of Sweden, the King of Jordan, the King of Monaco and Prince Andrew of the UK. The Royal Thai Army Procession will take place in Bangkok on June 23, while an exhibition in honour of the king – the world’s longest reigning monarch – will be held at IMPACT Convention Centre in Muang Thong Thani from May 26 to June 4. Furthermore, three other events shall be held on June 12. The first event will take place at 4:00 p.m. at the Ananta Samakhom Throne Hall, where Their Majesties the King and Queen and members of the Royal Family and monarchs from various countries will attend the ceremony of paying tribute to His Majesty on his diamond jubilee. The second event will be held at 6:00 p.m. at the Royal Thai Navy Convention Hall, where His Majesty the King will open an exhibition featuring his royal activities and projects during the past 60 years of his reign. The foreign monarchs will also be invited to attend the exhibition. The third event will take place in the evening, with a grand Royal Barge Procession held along the Chao Phraya River for the foreign monarchs to view at the Royal Navy Institute. On June 13, His Majesty the King will host a banquet for the foreign monarchs at the Chakri Throne Hall within the Grand Palace. A representative of the monarchs will give a speech of tribute expressing best wishes to His Majesty. In 2006, the Thai nation comes together to celebrate the most auspicious occasions of His Majesty King Bhumibol Adulyadej’s 60th Anniversary or the Diamond Jubilee of His Majesty’s Accession to the Throne together with His Majesty’s 80th Birthday Anniversary. The Royal Barge Suphannahongse passes the Grand Palace on the Chao Praya River. The Royal Barge is rehearsing its part in festivities marking the 60th anniversary of Thai King Bhumibol Adulyade's accession to the throne. Members of the Thai navy row the famous "Narai Song Suban" barge during their rehearsal to celebrate Thai king Bhumibol 60th anniversary at Chao Phraya river in Bangkok, 28 April 2006. King Bhumibol, 78, the world's longest reigning monarch, is deeply revered in Thailand and will celebrate his 60th anniversary on the throne in June. #1: Thai King Bhumibol Adulyadej lights candles during a making ceremony ahead of his Coronation Day on 05 May at the Grand Palace in Bangkok, 04 May 2006. Thai King Bhumibol will celebrates his 60th anniversary to the throne in June, with some 30 monarchs from around the world expected to attend celebrations in Bangkok. #2: A man walks past portraits of Thai King Bhumibol Adulyadej on his Coronation Day in Bangkok, 05 May 2006. Thai Royal guards fire artillery to salute Thai King Bhumibol Adulyadej in commemoration of Coronation Day at Sanam Luang park outside of the Royal Palace. The 56th anniversary of his official coronation day occurs in the year the king celebrates the 60th anniversary of his ascension to the throne. He ascended to the throne in June 1946 after the sudden death of his elder brother King Ananda Mahidol. The world's longest reigning monarch's 60th will be celebrated with grand ceremonies from June 9 to 13. Kings and queens from 26 countries, including the Emperor of Japan, will attend the celebrations, the highlight of which will be the Royal Barge Procession of 52 barges and more than 2,000 navy rowers. The exhibition features His Majesty’s biography, his activities, and royally initiated projects. There are stage performances to raise funds for royal charities and souvenirs to be put on sale. Royal Thai Navy Convention Hall, 18.30 hr. Royal Navy Institute, 19.00 hr. Chakri Maha Prasat Throne Hall, 19.30 hr. 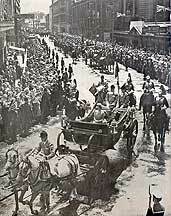 A parade of 3,000 people, comprising representatives of various countries and blood donors. Representative of youths from six language groups, namely Thai, Chinese, English, French, Hindi, and Arabic, will declare that they will support voluntary blood donation and serve as role models for other youths. The opening ceremony will be broadcast live via Global Network. At the National Blood Center on Henri Dunant Road, blood donation services will be open to the public and there will be a blood exhibition. Free medical check-ups will also be offered to visitors. Buddhist monks lead people in a candle-light triple circumambulation of the Marble Temple in Bangkok, Thailand, Friday 12 May 2006 on World Visakha Puja Day and the auspicious occasion of the 60th anniversary of His Majesty King Bhumibol Adulyadej's ascension to the throne this year. He is the world's longest reigning monarch. The United Nations has designated Visakha Puja Day, a holiest day of all Buddhists marking the birth, enlightenment and nirvana of the Lord Buddha, as a world significant day called the World Peace Day and Thailand as the World Buddism Centre. I sent the message to the embassy and they very kindly forwarded it to the Palace in Bangkok. Today the Ambassador wrote back to say that my letter had been laid before His Majesty and His Majesty has expressed his appreciation. People shoul write to their Thai Embassy the reply is really nice. King Bhumibol Adulyadej recives the UNDP Human Development Lifetime Achievement Award from United Nations Secretary General Kofi Annan at Klai Klang Won Palace in Prachuab Khiri Khan province, about 281 km (174 miles) south of Bangkok May 26, 2006.The award presentation is meant to honour the King on the occasion of the 60th anniversary celebrations of his accession to the throne this year. Thousands of spectators lined the banks of the Chao Phraya river yesterday for the first dress rehearsal of the Grand Royal Barge Procession, which is to be held on June 12 to celebrate the 60th anniversary of His Majesty the King's accession to the throne. The actual procession on June 12 will be viewed by Their Majesties the King and Queen and royal guests _ the monarchs and heads of state from 26 nations _ at the Royal Navy Institute (Ratchanavik Sapha), situated by the Chao Phraya. A total of 2,082 oarsmen rowed the 52 traditional-style barges, four of them major royal barges _ the Suphannahongsa or Golden Swan, the Narai Song Suban King Rama IX, the Anantanagaraj or Multiple-Headed Naga, and the Anekajatibhujonga or Innumerable Naga Figures. There are 12 barges with animal figureheads and 36 smaller ceremonial barges. By 5.30 pm., the procession had arrived at the Royal Navy Institute as scheduled, with the 45-minute boat song describing His Majesty's contributions to the country, the beauty of the barge procession and the beauty of Thailand. About 20,000 krathongs and 600 floating lanterns will be launched on the night of June 12 to give Their Majesties and the royal guests a splendid view before leaving. Monarchs from Brunei Darussalam and Malaysia will visit Thailand in person to join the 60th anniversary celebrations of His Majesty King Bhumibol Adulyadej’s accession to the throne in June. Both countries are Thailand’s ASEAN partners and their monarchs have close relationships with Thailand. As a prosperous oil and gas producing country with a small population ruled by His Majesty Sultan Haji Hassanal Bolkiah Mu’izzaddin Waddaulah, the 29th of an unbroken line dating back 600 years, Brunei Darussalam is a stable, healthy, and hospitable society. Aged 60, the Sultan of Brunei Darussalam completed his studies at Sandhurst Royal Military Academy in the United Kingdom. He ascended the throne in1967. In addition to being head of state, the Sultan also serves as the prime minister, defense minister, and finance minister. He has paid several visits to Thailand, and among the visits were two state visits as guest of His Majesty the King in 1988 and 2002. Aged 63, His Majesty Tuanku Syed Sirajuddin Ibni Al Marhum Tuanku Syed Putra Jamalullail, the Yang di-Pertuan Agong of Malaysia, ascended the throne in 2001. Like the Sultan of Brunei Darussalam, the monarch of Malaysia graduated from Sandhurst Royal Military Academy in the United Kingdom. He paid several private visits to Thailand, but has not paid a state visit here since his ascension to the throne. BANGKOK, June 3 (TNA) - Thailand's activities and ceremonies marking the auspicious occasion of the 60th anniversary of His Majesty King Bhumibol Adulyadej's accession to the throne this year will be broadcast in China. China's state-run television, CCTV International, has agreed to join with MCOT Public Company Limited (MCOT), Thailand's largest media organisation, to broadcast the activities and ceremonies in honour of HIs Majesty the King. These include gracious Royal and state ceremonies to be organized in Bangkok on June 12-13, in which royalty and distinguished guests around the world are invited to attend, the core of Thailand's grand celebrations of the auspicious occasion of His Majesty the King's 60 years on the throne--as the world's longest reigning monarch. NONTHABURI, June 2 (TNA) - A grand exhibition in honour of His Majesty King Bhumibol Adulyadej on the auspicious occasion of the 60th anniversary of the beloved Thai monarch's accession to the throne, which was jointly organized by the Thai public and private sectors, will be extended until June 11. The Royal exhibition is being held at the IMPACT Trade and Exhibition Centre in Muang Thong Thani of Nonthaburi province--on the outskirts of Bangkok. As requested by members of the general public, the government, in cooperation with the private sector, agreed on Friday to extend the grand Royal exhibition until June 11. The Royal exhibition, visited by crowds of millions of the Thai public so far, was graciously divided into sections, including His Majesty the King's biography, the Royal Wedding and Family, Royal-initiated projects and Royal activities, covering more than 140,000 square metres--from Hall 1-Hall 8 and Challenger Hall 1-3--of the centre. A rare photo exhibition featuring His Majesty the King during his trips abroad is open for public viewing at the Foreign Correspondents' Club of Thailand (FCCT). Organised by the Public Relations Department (PRD) and the FCCT to commemorate His Majesty's 60th year on the throne, the event gives the public an insight into the monarch's overseas journeys. All 30 exhibits are reprints of old photos, some dating back more than 50 years, which were taken by PRD photographers. The exhibition, entitled ''The King Abroad: 1959-1963'', was opened yesterday by Grand Chamberlain Khwankeo Vajirodaya, who was in His Majesty's entourage on several royal trips to Asia, Europe, the US and Australia. 1 - Grand Chamberlain Khwankeo Vajirodaya during the opening of "The King Abroad" photo exhibition. 2 - This photo shows His Majesty receiving a warn welcome during a royal visit to New York. 3 - This photo shows the King in a horse carriage with Queen Elizabeth II during his trip to the UK.